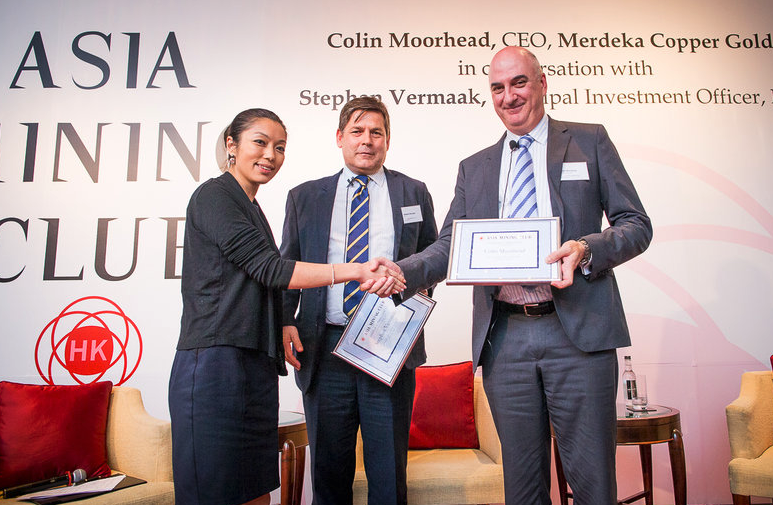 Asia Mining Club is excited to announce that Colin Moorhead, Chief Executive Officer, Merdeka Copper Gold, will be the guest speaker at our 6 April dinner. Merdeka Copper Gold is developing the Tujuh Bukit Project in East Java, Indonesia – one of the world’s top undeveloped copper and gold projects, with an estimated total JORC Compliant Resource containing 19 billion lbs of copper and 28 million oz of gold. Don’t miss this rare opportunity to learn about one of Asia’s most exciting mining projects. Following a short presentation on the project, Colin will be joined on stage by Stephan Vermaak, Principal Investment Officer, International Finance Corporation to discuss the challenges and opportunities of mining in emerging markets. With the event expected to sell-out, be sure to register ASAP to secure your seat. Colin has worked in exploration and mining for almost 3 decades since graduating from the University of Melbourne with a BSc. (Hons) majoring in geology and geophysics in 1987. Most of his career was spent with Newcrest Mining Limited where amongst other roles he was Chief Geologist for periods at Telfer (WA), Cadia (NSW) and Gosowong (Indonesia) mines before returning to Melbourne as General Manager Technical Services for the Newcrest Group in 2006. In 2008 Colin was appointed Executive General Manager Minerals responsible for global exploration, mining geology, resources and reserves governance and orebody knowledge. Colin left Newcrest in August 2015 and in January 2016 was appointed Chief Executive Officer of emerging Indonesian gold producer PT Merdeka Copper Gold, Tbk. Colin is the current Chair of the Risk and Audit Committee and is The AusIMM Board liaison to the Charter and By-Laws Review Taskforce. He is also representing the Institute as an ex-officio member of The Joint Ore Reserves Committee. Stephan Vermaak is a principal investment officer at IFC (the commercial arm of the World Bank Group) and the sector lead for mining in Sub-Saharan Africa. He joined IFC in July 2005. Stephan previously worked at the Industrial Development Corporation (IDC) for 10 years, where he was head of project & structured finance for 4 years and head of the resources and beneficiation department for 3 years. Stephan has been involved is some of the major mining deals in South Africa and Africa, including Mozal, Hernic, SA Chrome, Lonmin and Africo. He also has experience in post-conflict countries in Africa, including DRC and Guinea. Stephan has a bachelor of commerce from the University of Port Elizabeth and a LLB from the University of Stellenbosch.